Every year for the State of the City breakfast, San Jose’s 10 city council members choose a person or group to honor. Last year’s District 6 honors went to Our City Forest. Volunteers from the Friends of the Rose Garden surround District 6 Council member Pierluigi Oliverio at the Mayor’s State of the City Breakfast. Oliverio honored the group that through more than 4,000 volunteer hours and city employee’s help managed to get the San Jose Municipal Rose Garden back in shape so that the All-American Rose Selection took the garden off probation and gave it accreditation. This year Councilmember Pierluigi Oliverio saluted the Friends of the Rose Garden volunteers who have managed to return the garden to the prominent rose display it had been after more than 4,000 hours of hard work. 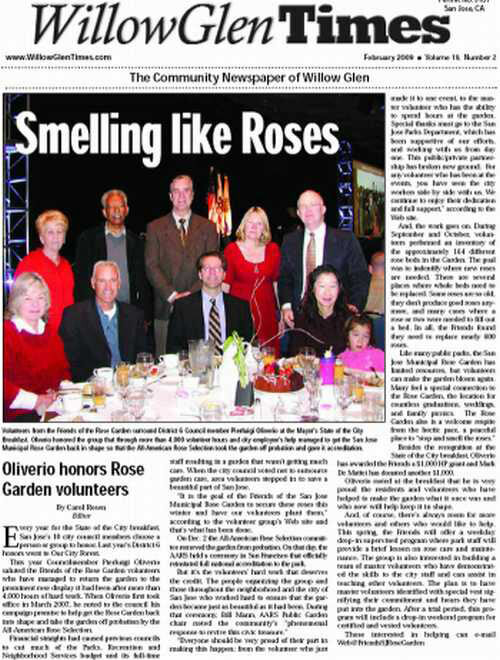 When Oliverio first took office in March 2007, he noted to the council his campaign promise to help get the Rose Garden back into shape and take the garden off probation by the All-American Rose Selection. Financial straights had caused previous councils to cut much of the Parks, Recreation and Neighborhood Services budget and its full-time staff resulting in a garden that wasn’t getting much care. When the city council voted not to outsource garden care, area volunteers stepped in to save a beautiful part of San Jose. “It is the goal of the Friends of the San Jose Municipal Rose Garden to secure these roses this winter and have our volunteers plant them,” according to the volunteer group’s Web site and that’s what has been done. On Dec. 2 the All-American Rose Selection committee removed the garden from probation. On that day, the AARS held a ceremony in San Francisco that officially reinstated full national accreditation to the park. “Everyone should be very proud of their part in making this happen; from the volunteer who just made it to one event, to the master volunteer who has the ability to spend hours at the garden. Special thanks must go to the San Jose Parks Department, which has been supportive of our efforts, and working with us from day one. This public/private partnership has broken new ground. For any volunteer who has been at the events, you have seen the city workers side by side with us. We continue to enjoy their dedication and full support,” according to the Web site. And, the work goes on. During September and October, volunteers performed an inventory of the approximately 164 different rose beds in the Garden. The goal was to indentify where new roses are needed. There are several places where whole beds need to be replaced. Some roses are so old, they don’t produce good roses anymore, and many cases where a rose or two were needed to fill out a bed. In all, the Friends found they need to replace nearly 600 roses. Besides the recognition at the State of the City breakfast, Oliverio has awarded the Friends a $1,000 HP grant and Mark De Mattei has donated another $1,000. Oliverio noted at the breakfast that he is very proud the residents and volunteers who have helped to make the garden what it once was and who now will help keep it in shape. And, of course, there’s always room for more volunteers and others who would like to help. This spring, the Friends will offer a weekday drop-in supervised program where park staff will provide a brief lesson on rose care and maintenance. The group is also interested in building a team of master volunteers who have demonstrated the skills to the city staff and can assist in teaching other volunteers. The plan is to have master volunteers identified with special vest signifying their commitment and hours they have put into the garden. After a trial period, this program will include a drop-in weekend program for certified and vested volunteers.